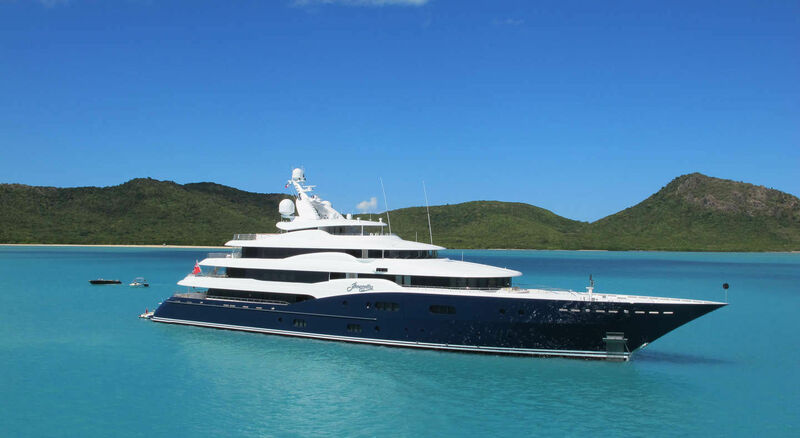 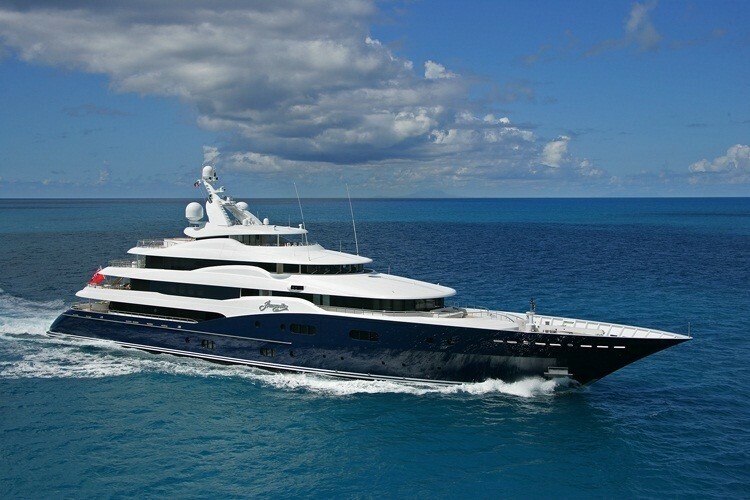 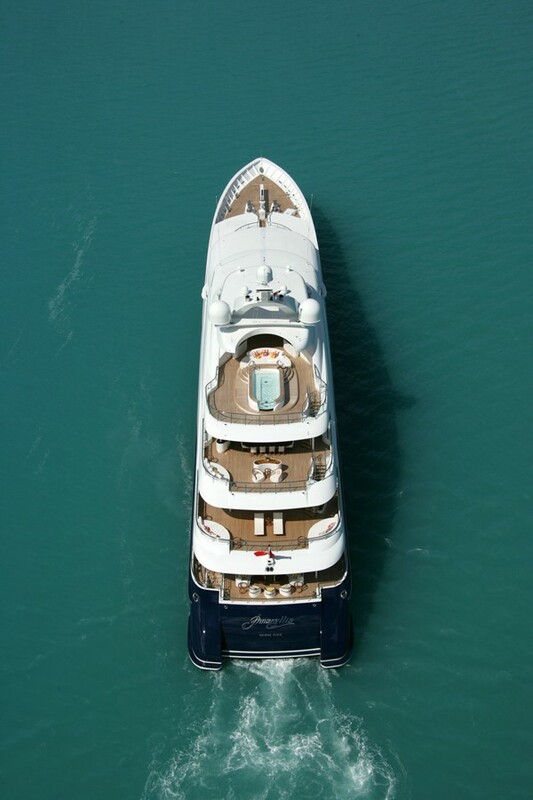 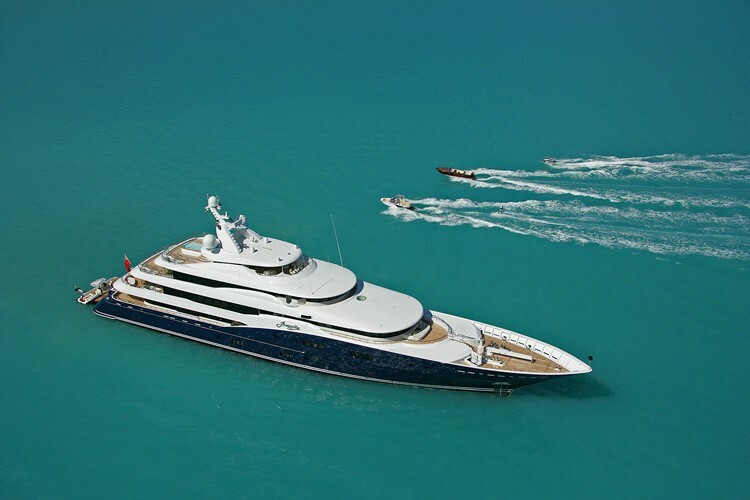 This imposing Abeking & Rasmussen custom-built 78m/257ft superyacht was launched in 2011. 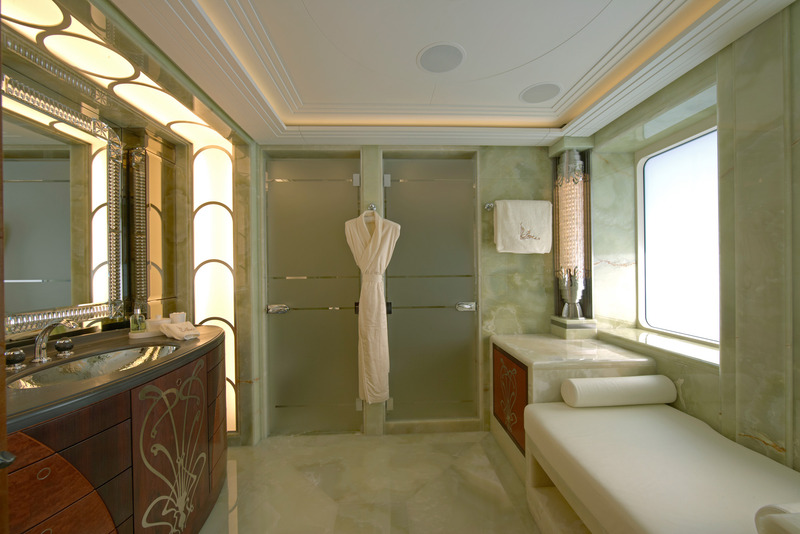 Her classic exteriors are the work of London-based design studio Reymond Langton Design, who also created her beautiful art nouveau interiors. 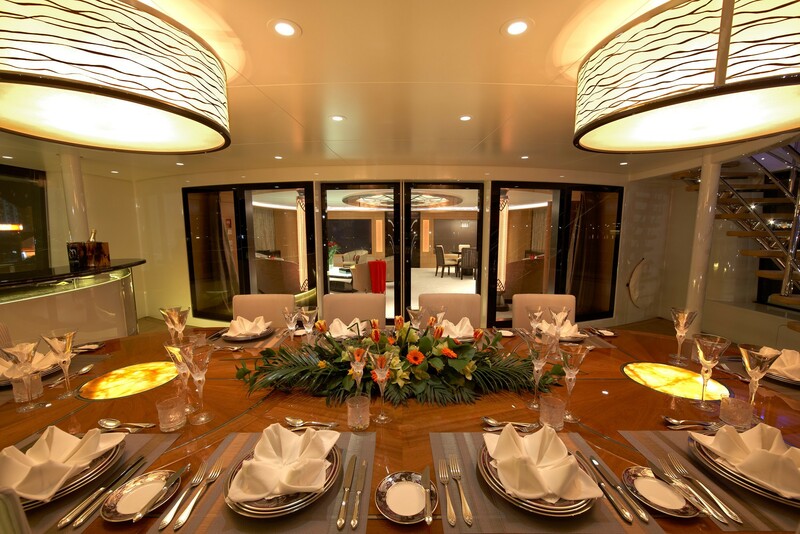 Her accommodation sleeps 12 guests over 6 cabins. 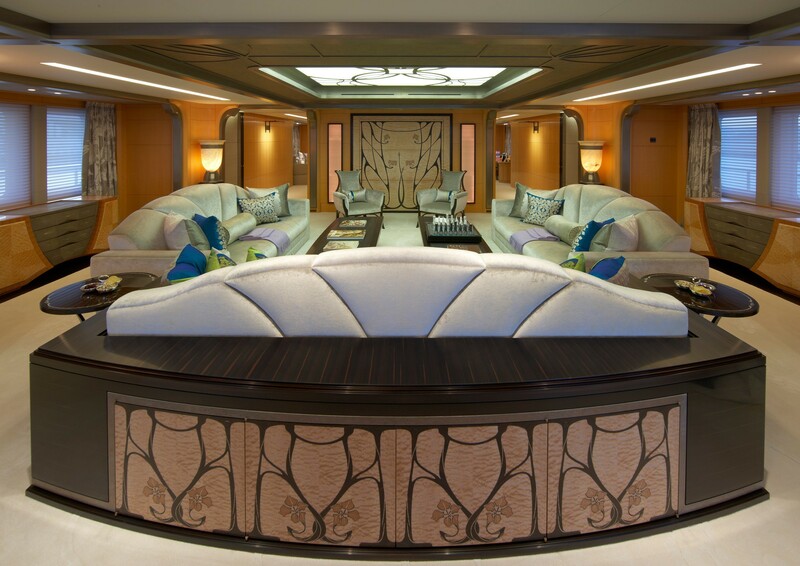 The main deck aft is laid out with a lavish stern salon with an outward-facing curved sofa, inward facing armchairs and two coffee tables. 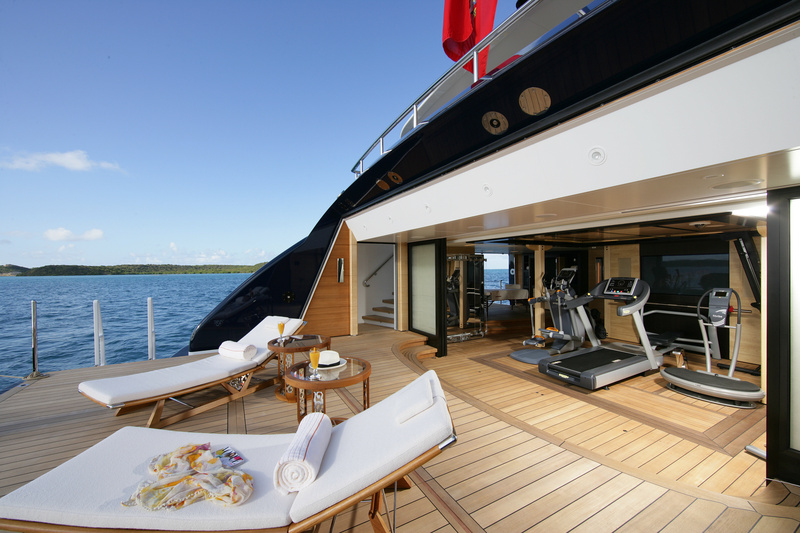 The port-side stairway connects down to the swim platform, where guests can lounge beside the water or exercise in the gym. 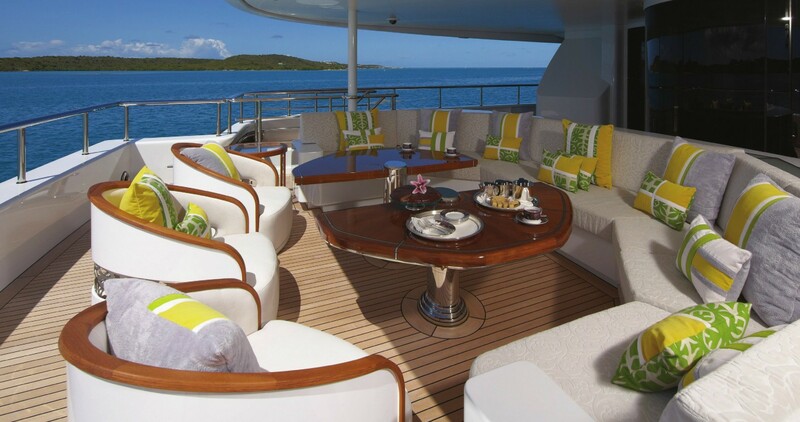 The clear upper deck aft places a sunpad sofa into the stern corners and leaves room for two sun loungers. 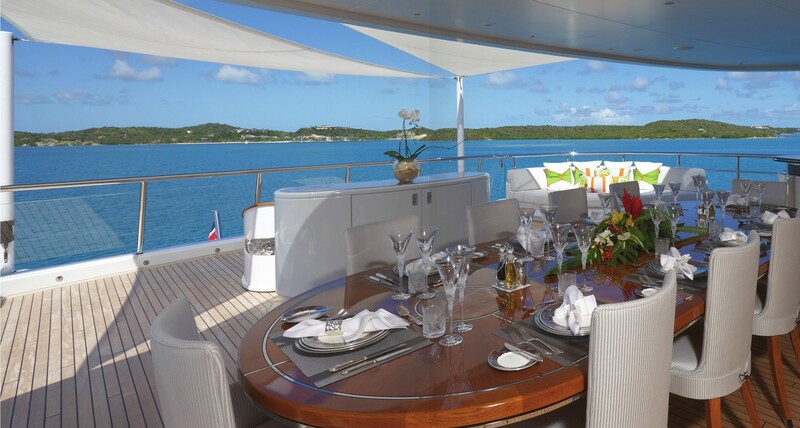 For alfresco dining, the group can open up the glass sliding doors of the skylounge or take to the sundeck for a meal at the loftiest position on board. 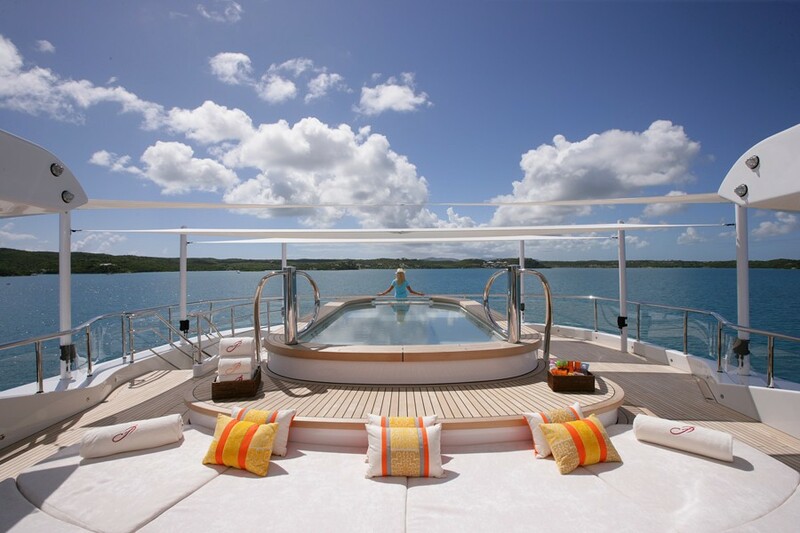 Guests also have the opportunity to enjoy forward views from the Portuguese deck where there is a sofa and plenty of space for morning exercise such as yoga. 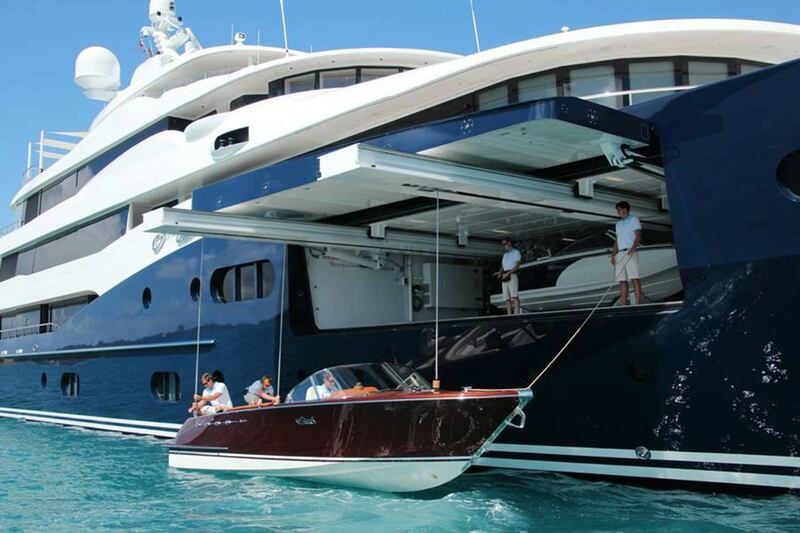 The tenders are stored on the bow and a davit crane provides safe and easy launch and retrieval. 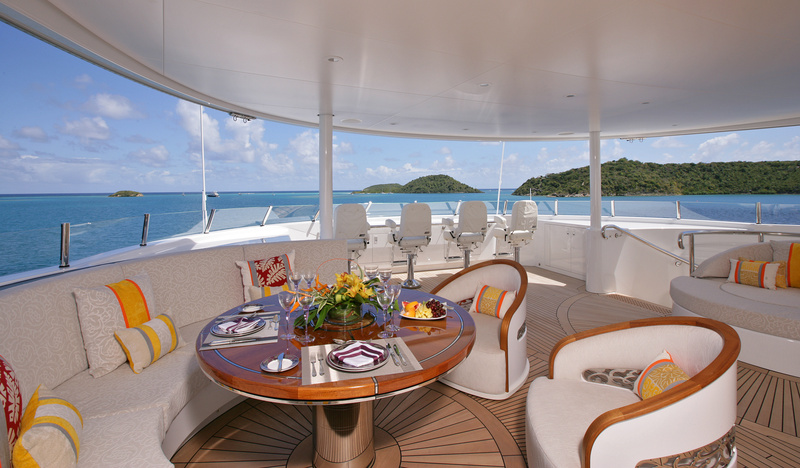 On the sundeck, the forward section is placed under the shade with an alfresco dining table on the port side behind the helm and a curved lounge on the starboard side. 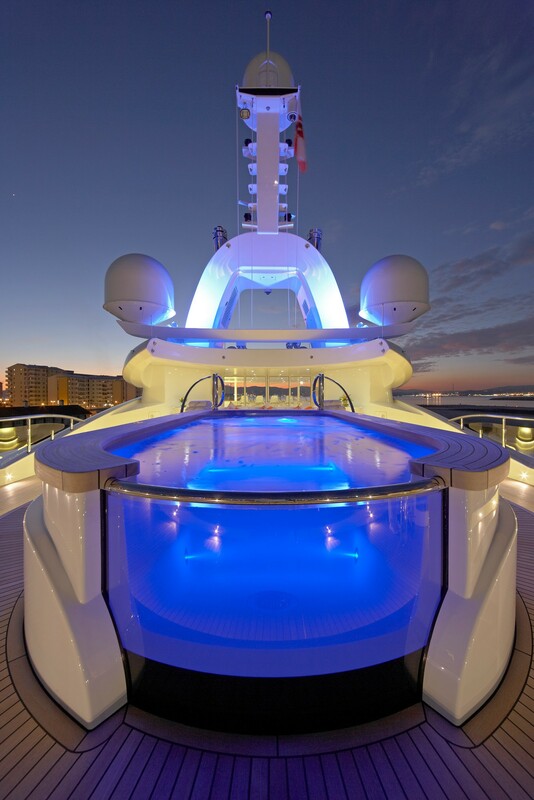 There is ample space in the centre for guests to move around, and the aft is fitted with the sundeck focal point: The glass-sided swimming pool lit from within by colour-changing LED bulbs. 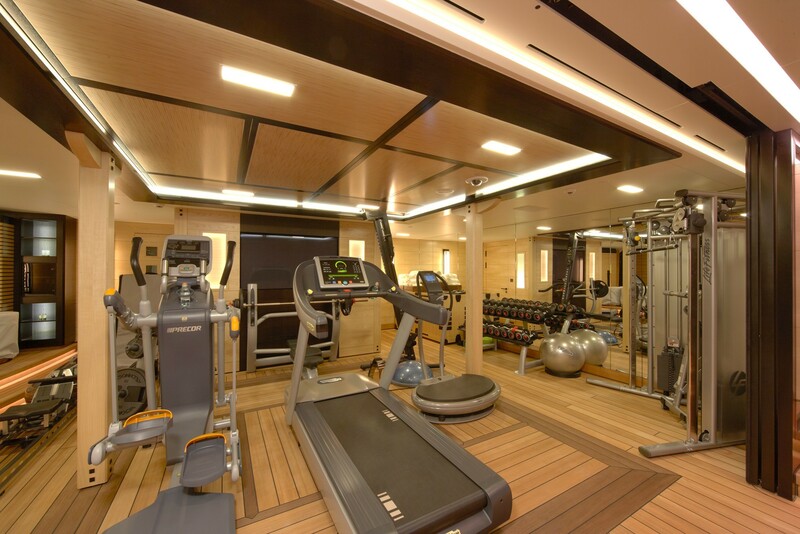 Within the lower deck stern there is a spacious beach club that makes full advantage of the 12m/41ft beam to offer charter guests a large gym with a stem room off to the side for post-workout relaxation. 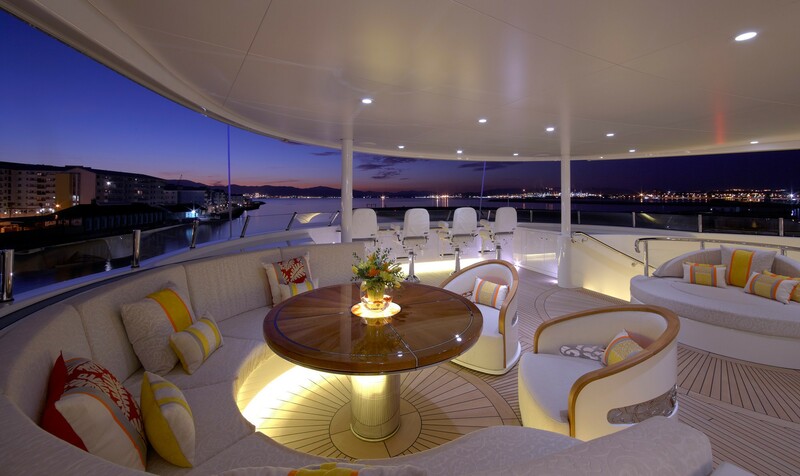 On the port side, there is a fold-down terrace to create a through-breeze and to let in the natural light. 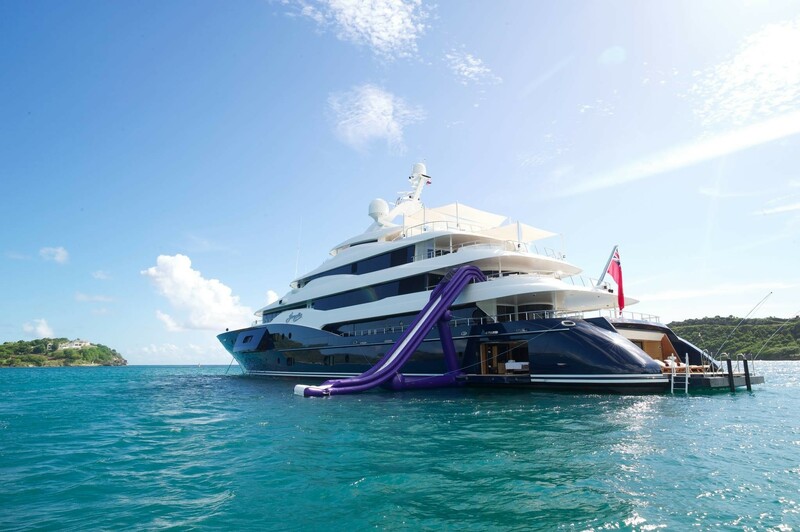 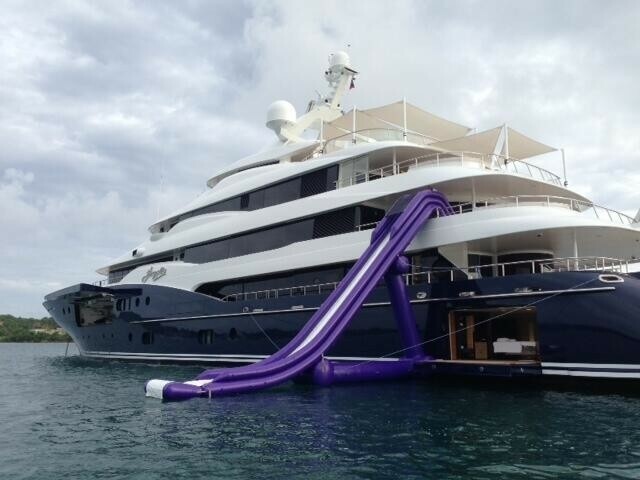 A spiral staircase connects up to the main deck aft, while forward of the beach club is the engine room. 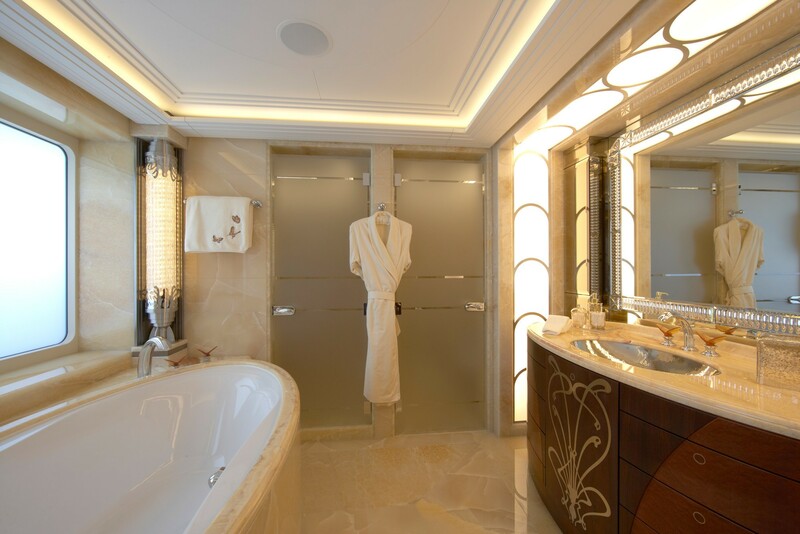 The centre of the lower deck hosts the majority of the guest accommodation and consists of four cabins - three doubles and one twin, all flawlessly styled in the art nouveau fashion and each have their own en-suite bathroom and dressing room. 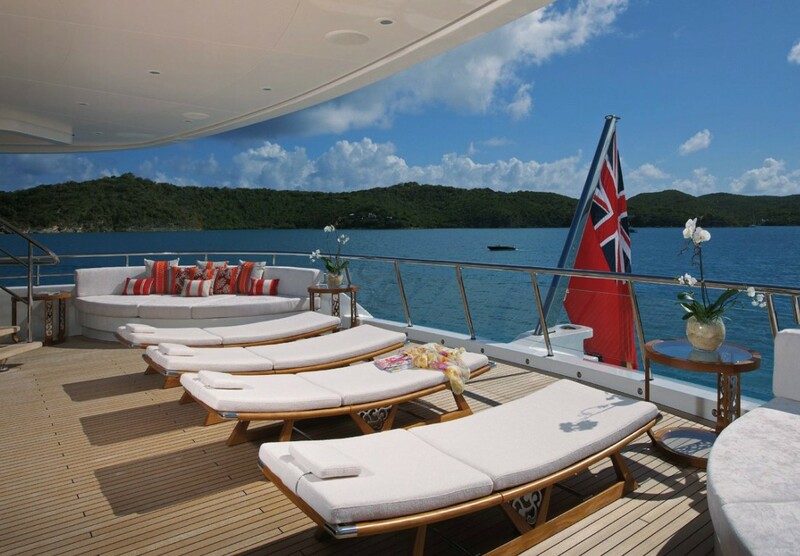 The lower foredeck contains crew accommodation for 23 as well as a mess and services such as laundry. 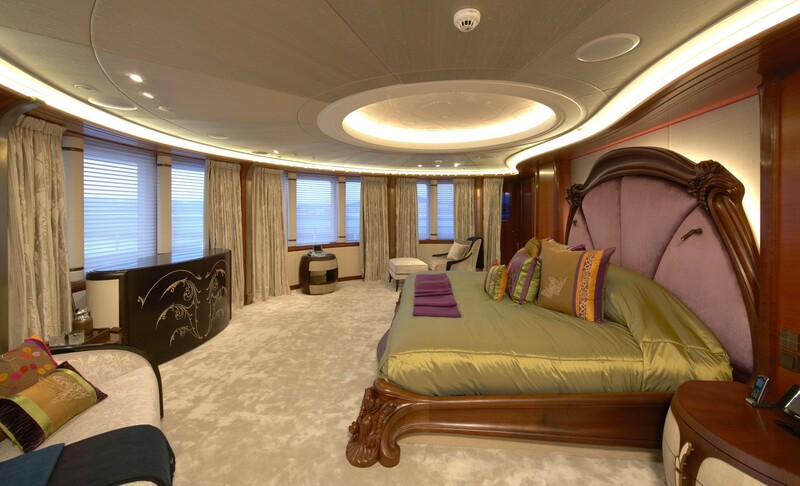 The VIP stateroom is located on the main deck forward and boasts greater room and its own study area as well as the same amenities as the cabins on the lower deck. 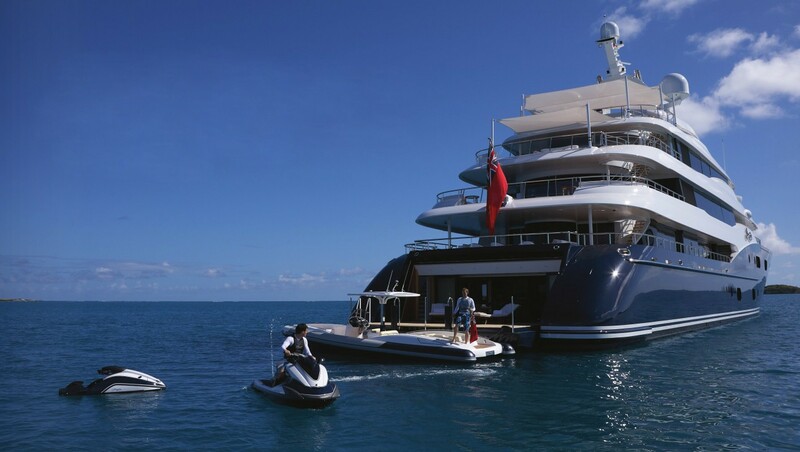 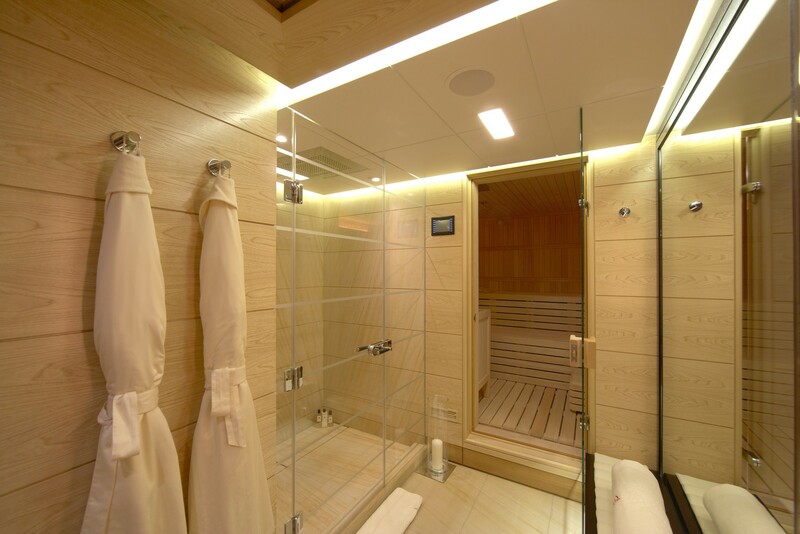 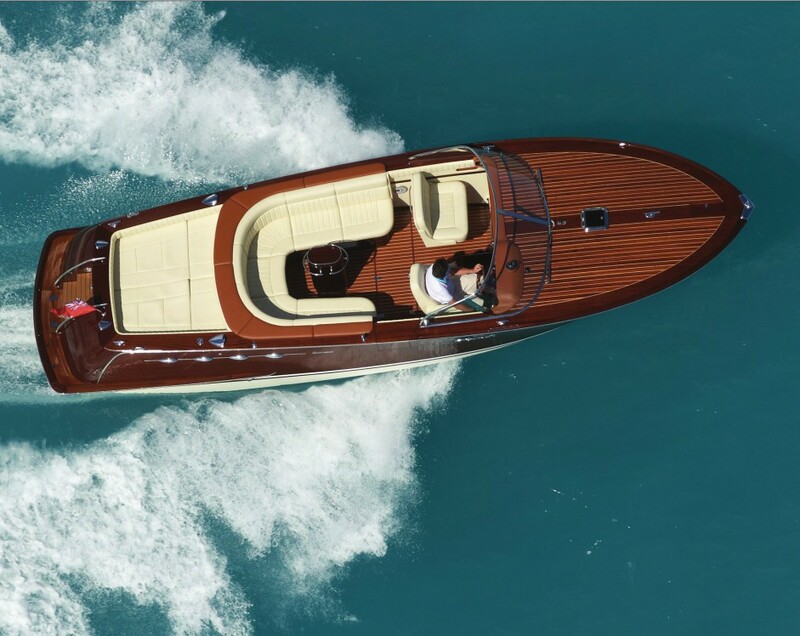 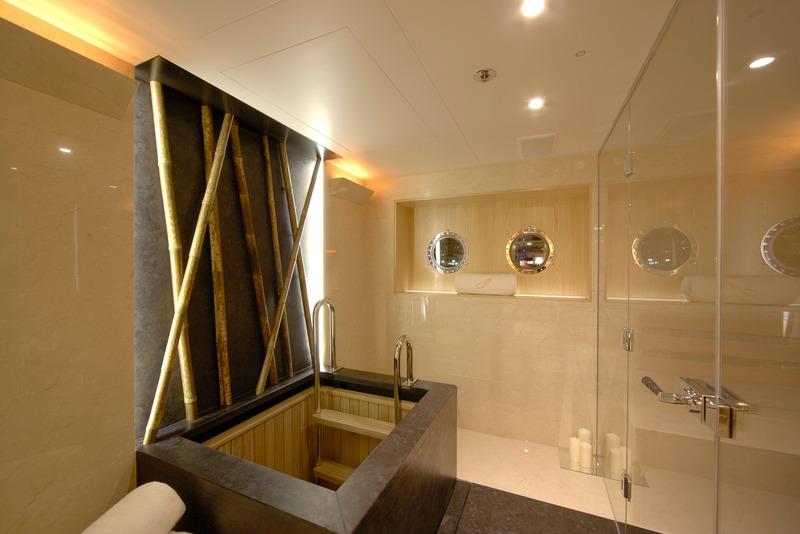 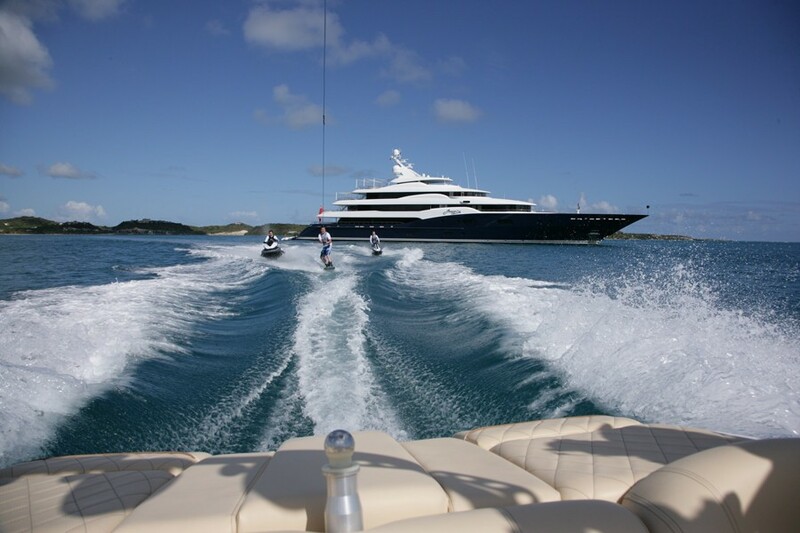 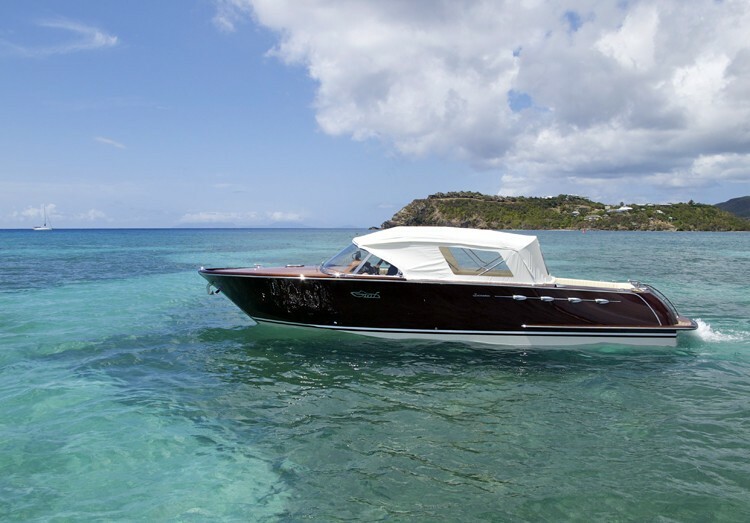 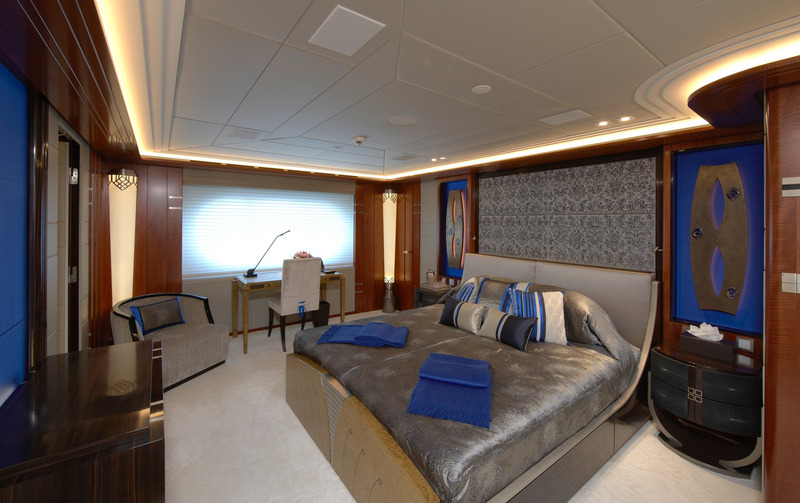 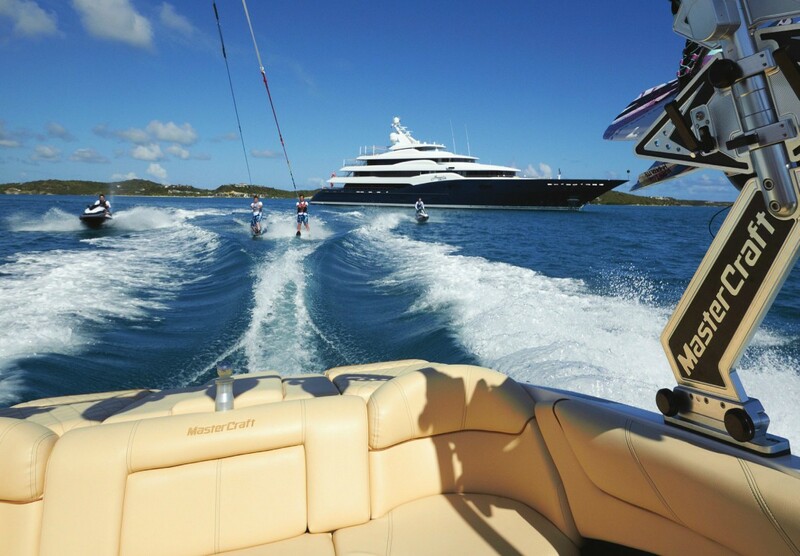 In from of the VIP stateroom is the tender garage, where tenders and water toys are launched and retrieved via a side-hatch. 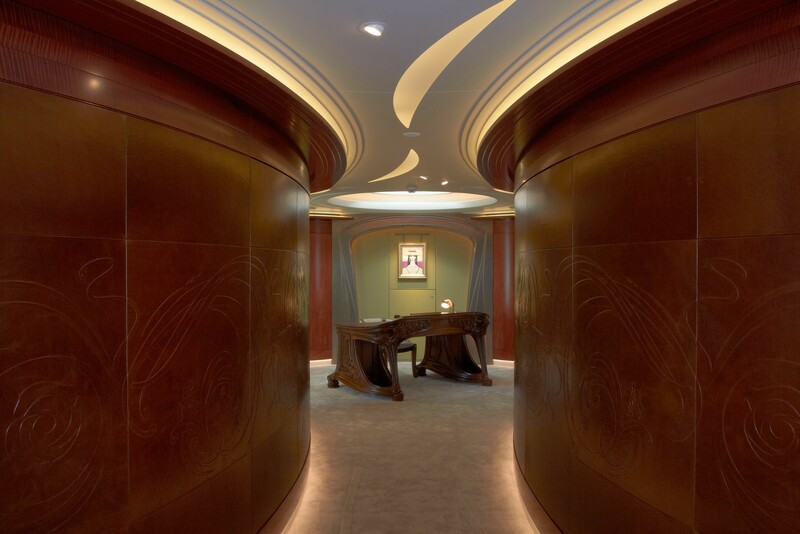 Behind the main foyer, the main salon and combined formal dining area create one large, bright environment where the stylistic curves of the art nouveau movement freely roam across the walls and ceilings for a more organic environment that exudes sophistication. 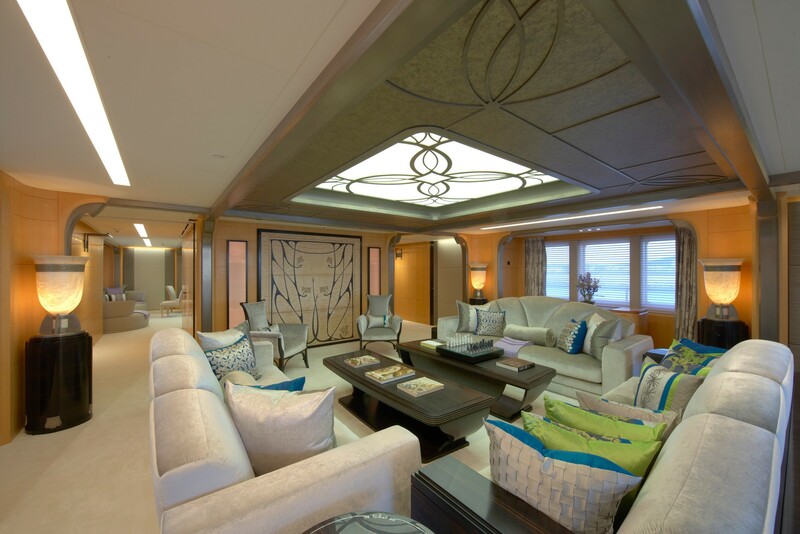 In the main salon, three settees with wave-like silvery headrests are clustered around two coffee tables for a comfortable place for guests to plan for the day ahead or take the weight off their feet. 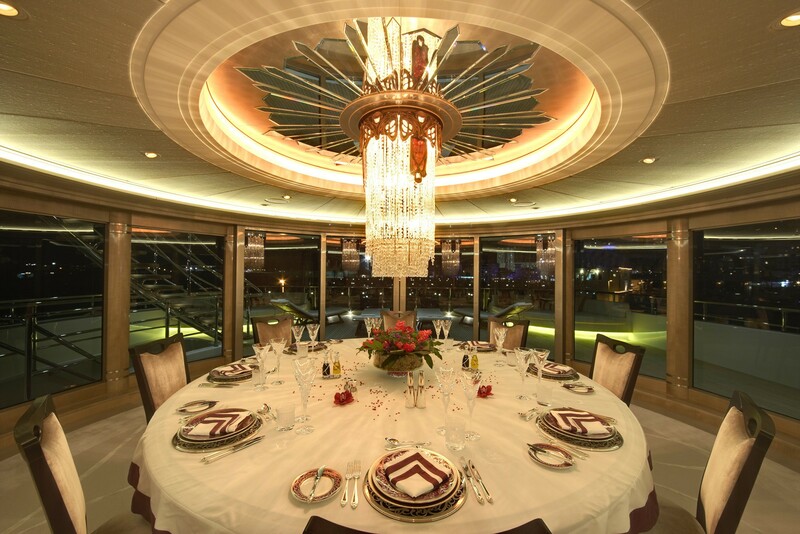 Farther forward, the formal dining table seats up to 12 guests for a memorable meal in close company. 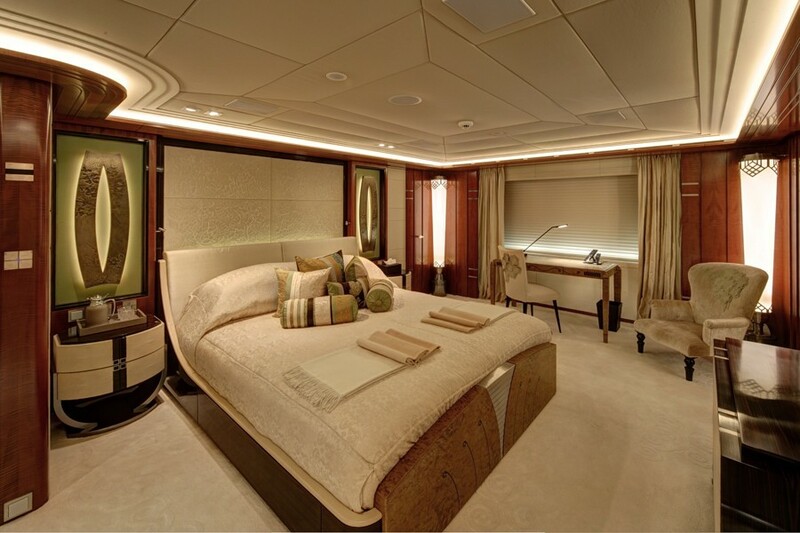 The upper deck forward is dedicated to the generous Master suite, taking in panoramic forward views and fitted with amenities including a lounge, his and her bathrooms and two walk-in wardrobes. 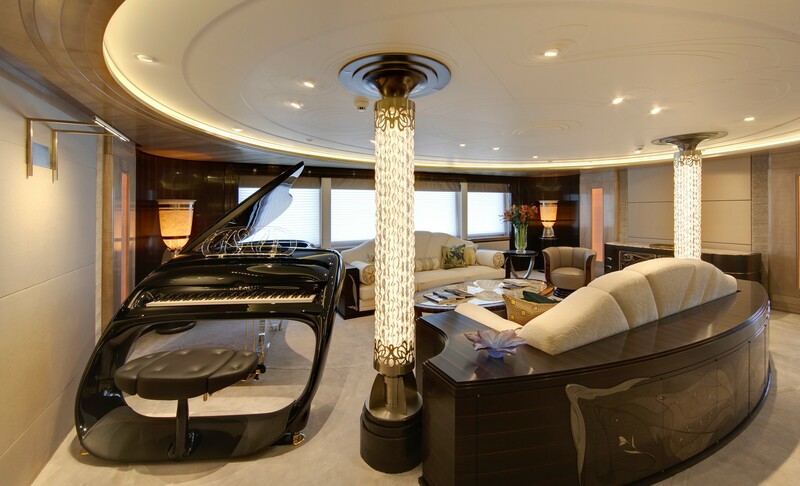 The artistic main foyer staircase is located centrally and for all guests to access the skylounge while ensuring privacy for the occupants of the Master suite. 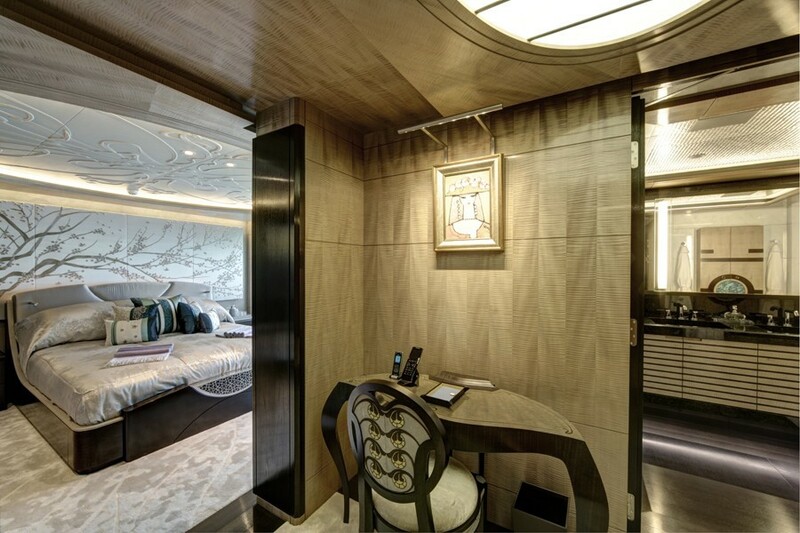 The art deco skylounge uses a more monochrome colour scheme and geometric lines for a stately interior where guests can entertain and impress. 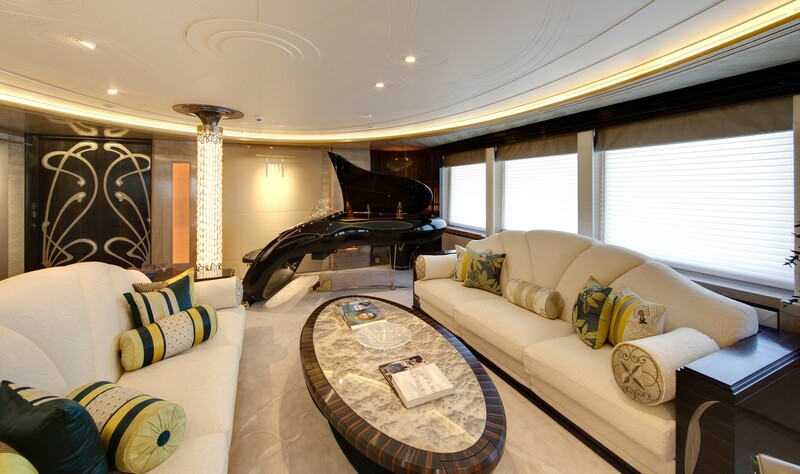 A grand piano will provide live music while guests socialise on the sumptuous sofas or dine down the corridor in the circular formal dining area, where the intricate chandelier and surrounding floor-to-ceiling glass panels ensure that guests can choose the ambience to best suit the occasion. 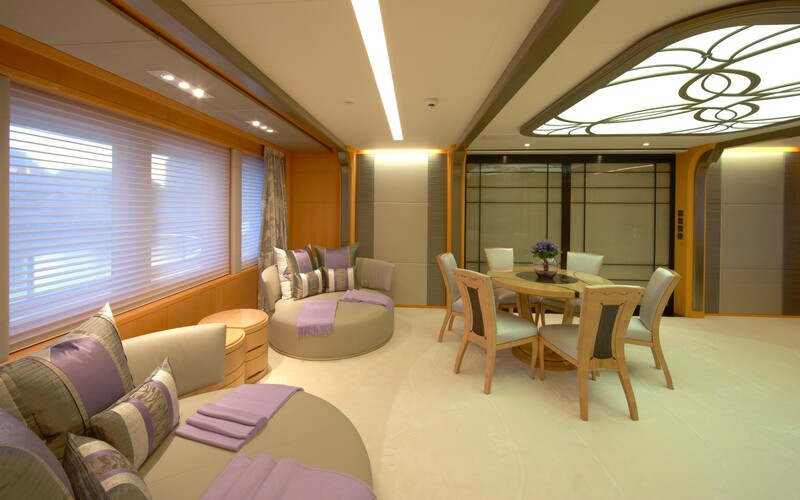 On the bridge deck, there is a final full-width salon that can be used as the children's playroom or used as a retreat to pursue hobbies in peace and quiet. 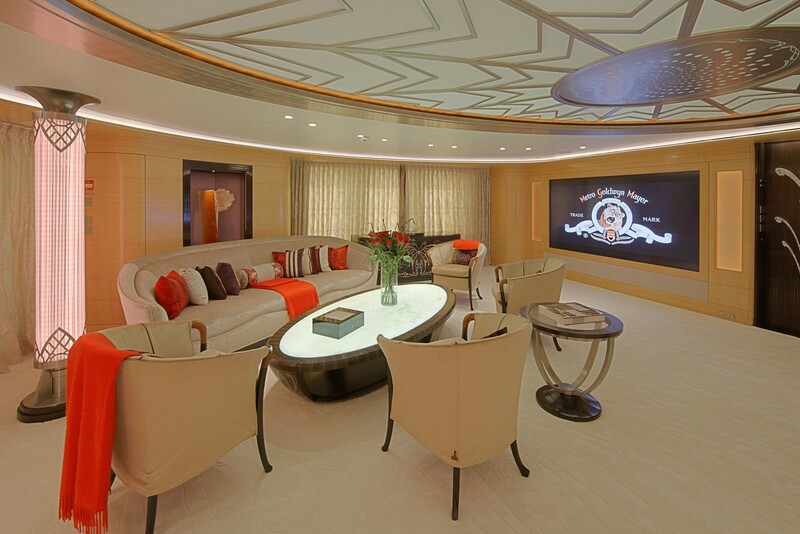 Two small sofas and a table with four surrounding chairs create a simple and clean style for games and television. 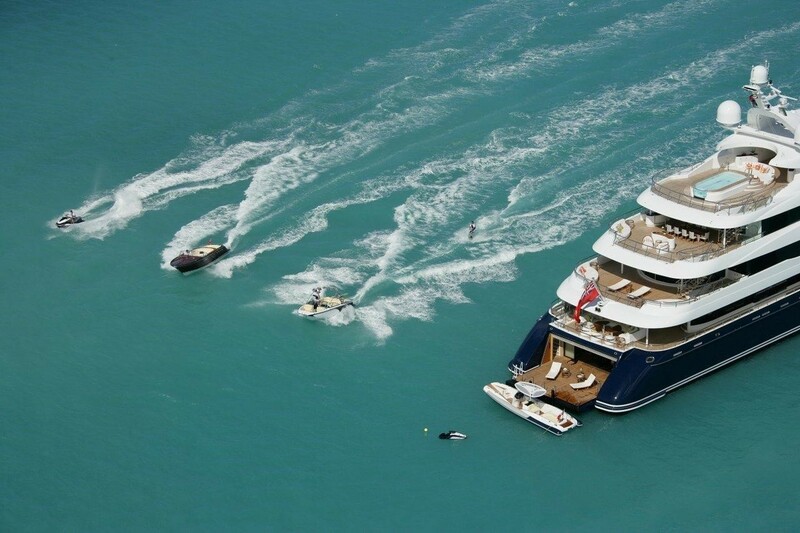 Caterpillar 3516 B engines allow for a top speed of 16 knots and a cruising speed of 14 knots. 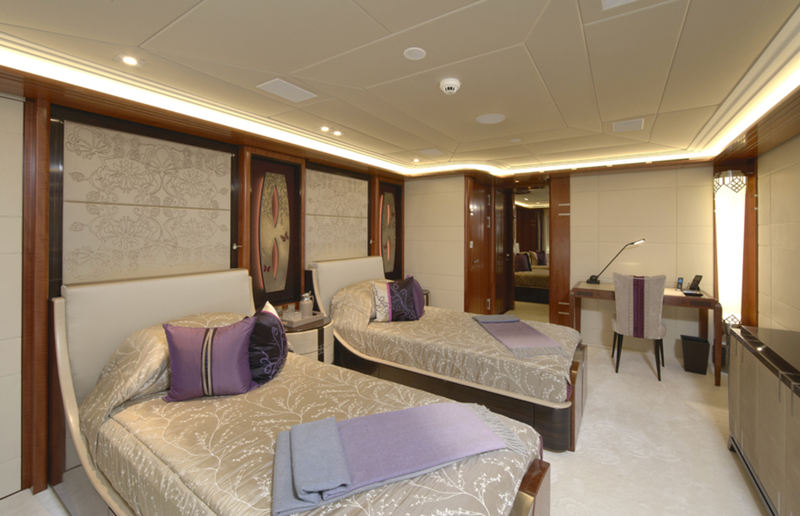 The accommodation sleeps 12 guests over 6 spacious cabins: 1 Master suite, 1 VIP stateroom, 3 double cabins and 1 twin cabin, all with en-suite facilities and a dressing room.